"Allergy sufferers have enough concerns to worry about — the availability of life-saving medical treatment should not be one of them"
New York's top prosecutor said he is launching an antitrust investigation into the maker of the EpiPen. Attorney General Eric Schneiderman said Tuesday his office was opening the investigation into Mylan Pharmaceuticals, weeks after the company came under intense public scrutiny for steady increases in the price of the life-saving drug that is administered during anaphylactic allergic reactions. The inquiry comes after a preliminary review by the Schneiderman's office found that Mylan may have inserted potentially anticompetitive terms into its sales contracts with numerous local school systems. The price increase is alarming allergy sufferers, their families and their doctors. Dr. Stuart From, chief of allergy, Englewood Hospital and Hospital Center, helps explain in NBC 4 New York's Jen Maxfield report. "No child’s life should be put at risk because a parent, school, or healthcare provider cannot afford a simple, life-saving device because of a drug-maker’s anti-competitive practices," Schneiderman said. Mylan said that it provided free injectors to more than 65,000 schools under its EpiPen4Schools program, and that at one time, schools that wanted to buy more injectors than the company provided could purchase them "with a limited purchase restriction." But the company said that no restrictions are in place now. "The program continues to adhere to all applicable laws and regulations," the company said. Mylan has increased the price of EpiPens from about $100 for two doses in 2008 to more than $600 this year, drawing intense scrutiny from the public recent weeks. Schneiderman's inquiry also comes about a week after an I-Team investigation revealed that the drugmaker fought to keep a cheaper generic version of the drug off the market. 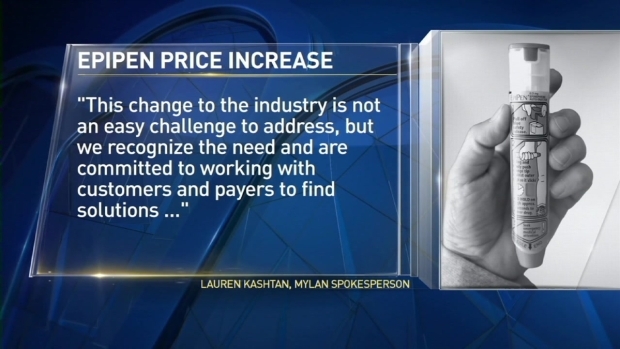 Mylan has previously said it is launching a cheaper generic version of EpiPen.